ALLAN WAYNE (1906-1978) was born Wayne Kohn in Terre Haute, Indiana. A dancer from his earliest years, he studied ballet extensively to become one of the first internationally recognized American ballerinos by the 1920's. He was a solo dancer with the Kosloff Ballet, Barrilov's Ballet Moderne, and the Ballet Russe de Monte Carlo under Fokine (who had been one of his teachers) and Massine. He was known as "the man of steel", as well as "a feather in a breeze" whose "home is in the air," and who danced with "keen dramatic understanding." His performing career ranged from being a well-known exhibition ballroom dancer to being a principal in the Metropolitan Opera Ballet. In 1929, he went to Europe where, as well as ballet, he studied in the Dalcroze, Laban, and Wigman schools, and with the Radan Mas Jodjana, a Javanese dancer and yoga teacher. In 1932, he returned to America where he presented his own work and danced with Doris Humphrey and Helen Tamaris in the WPA dance project. From 1943, Allan Wayne taught steadily until his death in 1978 in New York. 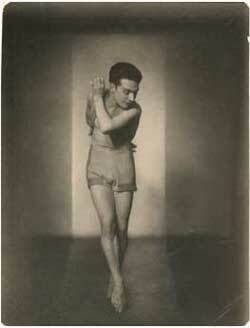 His students included Irmgard Bartenieff, Meredith Monk, Yvonne Rainer, and Martine Van Hammel. He developed a unique vision in his dancing and teaching,incorporating yogic breath and energy work into his classes to meld dance and the healing arts in an early and powerful experiential technique. Paul Langland is a choreographer, dancer and teacher based in New York City. He studied with Allan Wayne from 1975 -1978 and since then has been an active practitioner, developer, and teacher of Allan Wayne Work. The following interview with Paul by his student and collaborator Brendan McCall was conducted in the living room of Paul's house in Philmont, New York on August 25, 1996. Brendon: It's been almost 18 years since Allan Wayne died on November 4, 1978. You have been one of the primary teachers who has continued his work. Could you talk about how he influenced you, how his work has developed over the years, and why you feel the need to do an interview about him?